Today I’m excited to be interviewing Kshitij Author of Until You Came Along. Welcome Kshitij…. What inspired you to create your novel? What inspires me most are people and their lives, the way they act and behave socially as well as when they are alone. How each individual is different and has his/her own different motivations and perspectives towards life. I enjoy the real world, but always wish to have some magic involved in our day-to-day life. I start writing after midnight. I enjoy writing in serenity. On weekends I hope to do a bit of writing in mornings as well. The novel never stays the same and it constantly evolves with us. As I look back at my past novels, I think it’d not be the same if I’d have written it today. I like to do research to get my facts straight and make the story as realistic as possible so that the readers can connect with it. I research about different places, people and cultures. It’s lot of fun. I do most of my writing on my bed. Sometimes on my study table and sometimes on dining table. You’ll always find a cup of black coffee beside my laptop. Finishing the first draft of the story gives a lot of pleasure to me even though I know I’d have to change most parts of it. There is a sense of accomplishment associated with finishing a story. Before that it was just words without a proper direction or meaning. That’s a difficult question. The closest I think of is Kurt Ward from Until You Came Along. Because like him, I too believe in dreams and fantasy. And sometimes I just follow the voice of my heart without caring about consequences. I’m mostly a planner. While starting a novel, I always have some idea what it would look like when it is finished. But I want to try discovery writing as well. Letting the characters shape your story is so much fun. In Until You Came Along, the long subjective conversation between Kurt and Alyssa was an instance of discovery writing because while writing that part, I didn’t have a clue how it’d come up. But I let these two characters discover about each other and about themselves. It’s like two strangers with opposite views sitting together and talking about random stuffs. I think it was the most difficult part of writing, but it was most enjoyable as well. Alyssa. No doubt about that. I think it would be very difficult for me to create a character more unique than Alyssa. She was capable of exhibiting just about any emotion. Throughout the book, she’d keep readers guessing about her next move. She is glamorous, witty and highly unpredictable. I like to take simple aspects of human relationships and weave them with a bit of magic or supernatural. I enjoy writing Drama. I also love writing horrors. I guess I’ve watched too many horror movies and read horror novels. I’ve created Dark n Devilry series to separate my horror stories from rest of my work. To be honest, I don’t have a favourite author as I constantly try to experiment different kind of writings and new authors. But I do have favourite books. I liked Contempt by Alberto Moravia, House of Sand and Fog by Andre Dubus… In classics, I love Gone With the Winds. I also enjoyed the movie adaptation of these novels. Write daily. Write anything. There will be times when you’d not get the right words or idea to express or the plot would appear silly to you. In that case, switch to another story or just type random words. Never give up. I’m working on a full length novel right now. It’s about a man with a disturbed history. But he strives hard to get out of his troubled past, and tries to create a meaningful future with his kind and understanding girlfriend and an appealing job. Then one stormy evening, he meets his new, strange and socially awkward teenage neighbour- someone who doesn’t even belong to this century! The life between us has a lot of mystery and involves some historical elements as well. The more you write the more you’ll grow as a writer. Be content with criticism because not everyone is going to like your book. If writing makes you happy then you won’t have trouble finding the right words to pen a great inspiring story. Thank you Kshitij for taking time to do this blog interview, it has been great to hear about your novel. I wish you all the success with all other writing projects you may undertake in the future. Alyssa has been searching for something all her life—her future. She believes in nothing but success and winning. Manipulative, wilful, emotionally cold is the best way she can describe herself. To the world and her college mates, she’s glamorous, confident and has life on a silver platter—men dream of having her and women dream of being her! But Alyssa is blind to everything except success… until she meets Kurt, a dreamy exchange student, who challenges everything she believes, while his touch runs through her body like the sweetest flame, making her want things she knows she shouldn’t have! Kurt wants her heart and that’s the one thing Alyssa can’t give him. 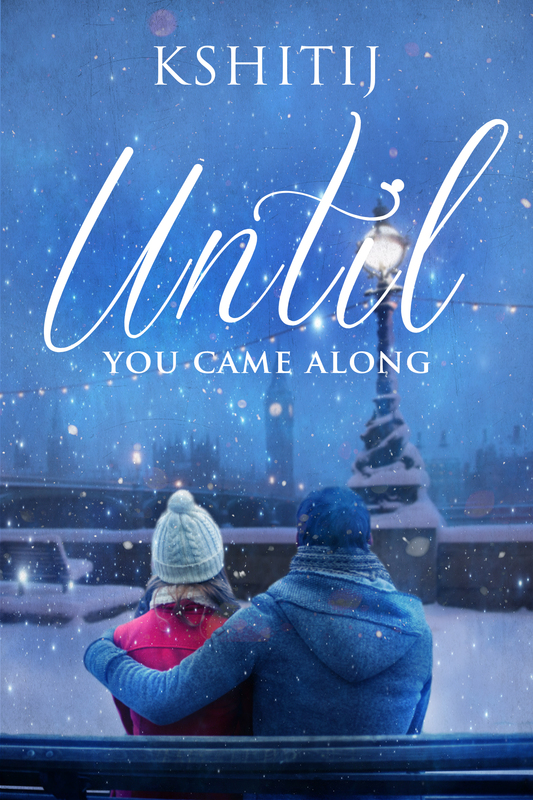 ← My Review of Until You Came Along Author Kshitij. Nice interview. I found myself nodding often at some of the things you do while writing as I do them also when I write. Best of luck with your writing.